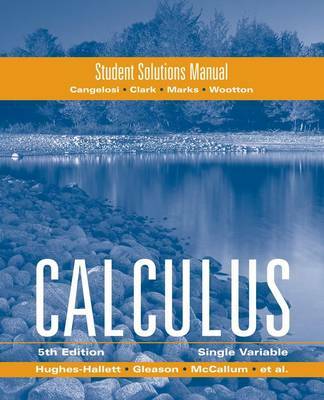 This Student Solutions Manual is meant to accompany, Calculus: Single Variable, 5th Edition , by Deborah Hughes- Hallett. Calculus teachers recognize Calculus as the leading resource among the "reform" projects that employ the rule of four and streamline the curriculum in order to deepen conceptual understanding. The fifth edition uses all strands of the "Rule of Four" - graphical, numeric, symbolic/algebraic, and verbal/applied presentations - to make concepts easier to understand. The book focuses on exploring fundamental ideas rather than comprehensive coverage of multiple similar cases that are not fundamentally unique.